After 15 months of planning a destination wedding, I am finally watching everything come together the week before the big day. I purchased a lot of items and had them shipped directly to the hotel so we wouldn't have to worry about transporting. The downfall of this is that I do not get to see everything in person until next week. I am looking forward to seeing our Second Line Parade items the most! We decided to have a New Orleans tradition at the wedding - a Second Line Parade. This is is a processional which will take us from the ceremony to the reception. The Second Line is something that originated from a New Orleans Jazz funeral, where a jazz band would play and parade in honor of a deceased person. Now the celebration of life, grand openings, births and weddings have added the second line parade to display the joy of social event. The second line is the group dancing or walking just behind the band. Many in the parade either have parasols and handkerchiefs to add to the spirit of the procession. 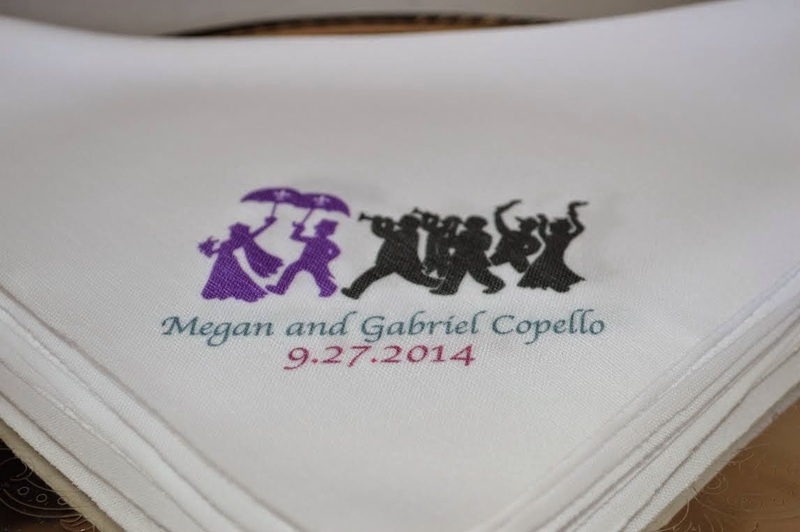 Gabe and I will each have a personalized parasol while the rest of the party will have personalized hankies! First up: Our Second Line Hankies from Etsy Store Roxygs. We had so many options to choose from to use on the hankie. We decided on the second line parade, names and our wedding date! These are so much fun - I love them! 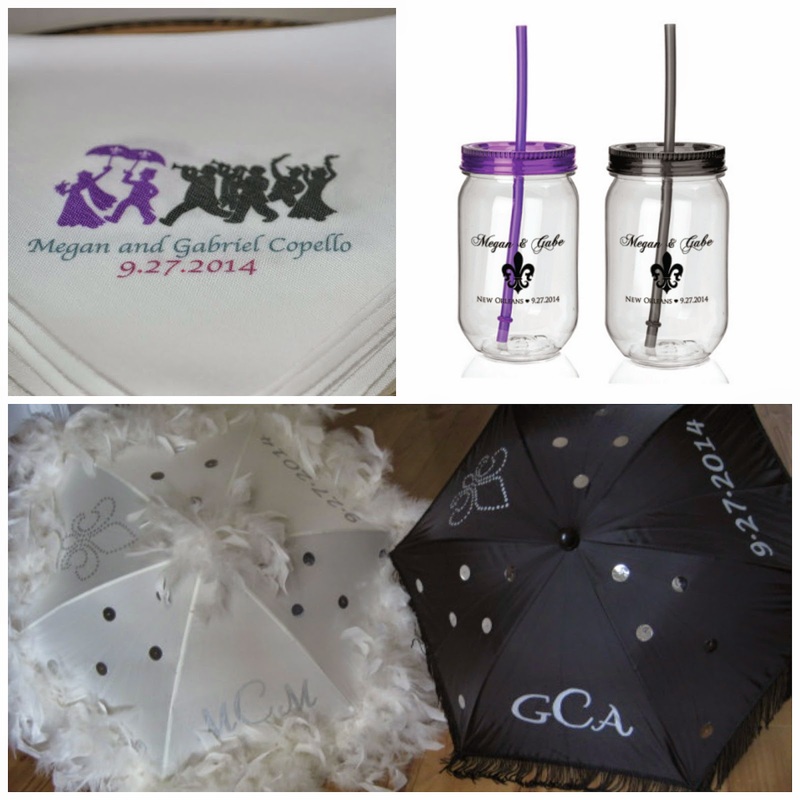 We got the umbrella's from Etsy store Gris Gris Art. 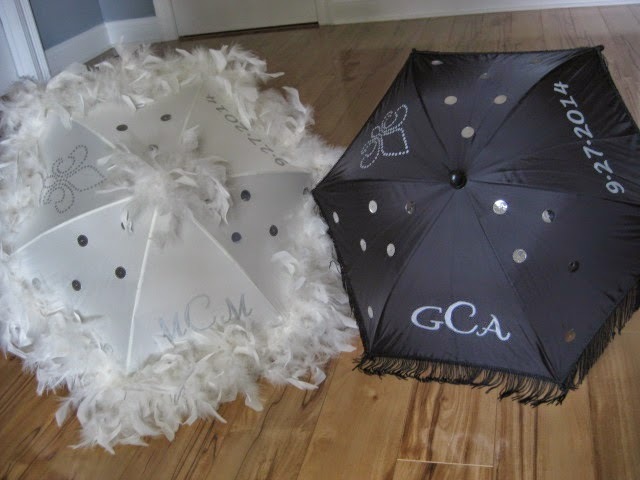 We opted for a black and cream parasol, mine with feathers and Gabe's with tassels. 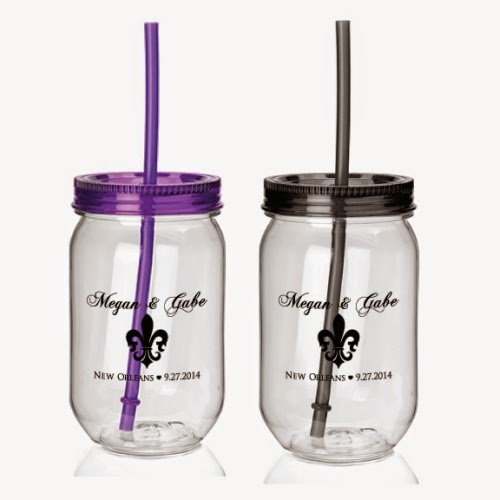 Each has our initials, wedding dates and a Fleur de Lis. This is my first item owned with my new initials! Lastly, we had personalized plastic mason jars made from Pinnacle Promotions (ask for Ashley) for everyone to have with them during their weekend! I initially bought them for the parade but logistically it became a nightmare. Now we are doing canned Abita beer and plastic single serving sized wine bottles. These cups will be part of the welcome package and those who choose to bring them to the ceremony can pour the beer and wine into these fun cups! Here is a video of a Second Line Parade in the French Quarter. That second line parade looks so fun!! I can't wait to see pictures! !